You have come to the right place if you are looking for fun, engaging and exciting Letter A themed activities to do with toddlers, preschoolers and kindergartners. Our activities are widely used by teachers, moms, dads, child care providers etc. for learning and teaching while being fun for the kids! Apple stamping is a lot of fun. Cut an apple in half, and carve out the shape of the letter “A”. 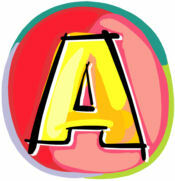 Have your child stamp the letter on a sheet of paper and say the “A” sound each time they stamp. Cut out a large white triangle for the body, and skin-colored circle for the head, and trace hand prints on white construction paper for the wings. Glue together, and add facial features and a halo. Staple several pieces of white construction paper together with a colored construction paper cover. Print “My A Book” and your children’s name on the cover. Cut out magazine pictures of those things which begin with the letter “A”, as well as actual upper and lowercase letters from ads or article titles. Let the children chose the pictures and letters they want, and glue them onto their book pages. Later, arrange a time for the children to read their books to you. Have a feelie box, that children can’t look into, such as covered with a towel or sheet. Have them guess the object starting with the letter “A” that you have placed in the box. One of the paper towel rolls, measure about 3″ down from the top and cut 1/2 way through. Measure another 2″ down and again cut halfway through. Remove the section between the cuts. Glue the second paper towel roll through this section. Paint the airplane and using craft sticks to form an “X”, paint them white and glue to the front of the airplane for a propeller. Break another craft stick in half and insert them in the tube under the wings for landing gear. Use 3 sections of a cardboard egg carton to form the body. Have the children paint it any color they wish. 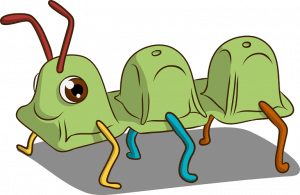 Using pipe cleaners, put antennae on the first section, and six legs on each of the 3 sections. Draw eyes or use wiggly eyes on the front section. Cut out two large boat shapes and punch holes around sides and bottom. With shoe laces or yarn (wrap ends tightly with tape to prevent fraying), lace the 2 pieces together. Make a rainbow shape for the top to fit on like a handle. Let the children color the handle and staple or glue to the top of the ark. Fill the boat with animal crackers. As each child selects a cracker to eat, have them tell what kind of animal it is. Cutout a large “A” from heavy paper or cardboard. Have the children collect acorns, and glue them to the “A”. Explain how acorns grow into oak trees. Cut out a big letter “A” for each child and let them make ant prints all over it with their fingerprints and a stamp pad. Use small tip markers to draw in legs. I am a teacher and I use this game for children in junior primary to learn the sounds of the alphabet. All children stand or sit in a circle. Place an alphabet card on the ground in front of them. Play some music and children walk around the circle. When the music stops, they sit in front of the closest card. We then go around the circle and each child has to tell me the sound of the letter they have. With older children, I ask them to tell me a word that begins with that sound, or has that sound in the middle or end. It works really well and the children have so much fun. Invite the children to perform acrobatic feats such as somersaults, head stands, back bends, bridges, rocking horses, etc. Be sure to put down a gym mat, or arrange a field trip to a gym. Consider sponsoring a gymnastics meet. Easy to make out of construction paper or poster board. Use buttons or beans to cover spaces. Have children match as you call out lower/uppercase, etc, first child to cover card yells “Bingo.” Prizes can be simple, such as a granola snack or extended time in a certain area. Aluminum “A” Cut aluminum foil into long strips and glue to a large cutout letter “A”. Discuss the uses of aluminum with your kids, as well as recycling. Have each child bring something recyclable from home and let them place in a recycle bin. Talk about things from home that begin with the letter “A” and see how many things the children can think of. Make paper airplanes and fly them around, or line up chairs in 2 rows and pretend it’s the inside of an airplane. Make up your own tickets, provide flags for someone to wave when the runway is clear. Take the children to a zoo! Most all zoos have a petting area for younger children. Talk about each animal and what it eats, what it feels like, and whether or not it would make a good pet. Decorate a box with the letter “A”. Inside the box place items or pictures of items that begin with the letter “A”. This also works well if you use pictures, and have each child in turn draw out one picture and tell it’s name and what they would do with it. Divide the children into groups of threes. Have the children in each group lie on the floor and use their bodies to form the letter “A”. Let the children in each group trade places and form the letter “A” again, so each child gets a turn at being a different part of the “A”. Then have the children gather in larger groups and form a giant “A”. At circle time, show the children pictures of astronauts and talk about what they do. Transform your drama center into the moon. Give the children white shirts, boots, and helmets to wear for the astronaut’s clothing. You can make an astronaut’s helmet by using a paper grocery bag or cardboard box and decorating with foil, stickers, pipe cleaners, Styrofoam balls and other items found in daycare. Have pictures of planets hanging all around the center, and maybe even have the children paint a mural of a rocket ship during creative time and put that up on the wall. Have the children pretend they’re walking on the moon, and talk about what it would be like to be weightless in space. Cut out magazine pictures of animals and laminate, if you wish. Have the children put them on the wall in daycare to make your own zoo, or put the pictures together in a picture book for the daycare. Then have the children draw 4 of their favorite animals and make a picture book for each child to take home. Alternatively, photocopy animal coloring book pages for the children to color and make a picture book. Make animal masks out of paper plates or grocery bags using decorative items such as stickers, tissue paper, markers, glue, yarn, etc. Have a puppet show or small play and let the children make up their own lines for their animal. Along the astronaut theme, have children look for “moon rocks” in a treasure hunt. Make the moon rocks out of balled-up aluminum foil or paint Styrofoam balls in silver. Use a globe or world map to show the children where these different continents are compared to our own. Talk about what a continent is, and read books or show videos on the different continents to learn about their culture. Encourage the children to become a group pen pal (for younger children) or individual pen pals (for older children) with children from other places in the world. There are sources all over the internet to get them started on this. You can also explore what kinds of toys children on these continents play with, and show the children how to make their own. Let the children pretend to be alligators in a swamp. Call “Alligators Go!” and “Alligators Stop!” at random. When the Alligators are all going, they make the short sound of the letter “A”. When they are stopped, they are very quiet. Anyone who makes a sound when they’re stopped is “eaten” and is out. Give the children clues about an animal, and let them guess which animal you are describing. Mount pictures of animals on a tag board or felt board. Have the children sort the pictures into farm, pet or zoo categories. Grow Your Own Avocado Plant! Get several avocados. Cut them open to remove the pits. Help the children plant the pits by sticking three toothpicks in the sides of each pit, evenly spaced. Fill a small glass with water, and set the pits so that the pointed end of the pit is in the water. Watch the root of the avocado grow, then replant in loose soil. This makes a beautiful plant, but it will usually not yield avocados, as most avocado trees take an average of 13 years to produce fruit, and they must be cross-pollinated with other avocado trees to produce fruit. Teach the children to make accordion folds, and have them create something that makes use of the folds. Examples include a bird with wings, a woman wearing a skirt, or a simple paper fan. Alphabet Hunt: Hide some pictures of things beginning with the letter “A”, around the room, some easily visible and some a little harder to find. Then let the children go on a hunt for the pictures. Ants on a Log or Raft: Spread cream cheese on a piece of celery (log) or a Triscuit-type cracker (raft). Let the children put raisins on their logs and rafts. Letter “A” Taste Test: Try apples, avocados, artichokes, apricots, and any other foods starting with the letter “A” that you can find. Baked Acorn Squash: Show the children an acorn squash. Put an acorn and the squash beside each other, and discuss how they are alike and how they’re different. Ask the children how they think an acorn squash got it’s name. Help the children see that an acorn squash is shaped like an acorn. Then use the squash to make A-Okay Acorn Squash as follows: Cut the squash in half lengthwise, scoop out seeds and pulp. Put the squash face down in a baking pan and pour in about 1/2 inch of water. Bake at 375 for 25 minutes. The squash is done when the flesh is soft. Pour the water out and turn the squash over. Put a little butter and brown sugar over the squash, and add cinnamon or nutmeg if desired. Put the squash back in the oven until the butter has melted. Enjoy! Finger puppets are always a big hit in role playing with children. They can be easily made from construction paper, and decorated with almost anything, such as cotton balls, glitter, yarn, markers, stickers, etc. Have each child make up a finger puppet and divide the children into small groups. Have each group do a small puppet show for the others. You can easily construct a stage out of a cardboard box, using tissue paper or fabric scraps for the side curtains. Let’s sing hurray for A. This is the best information for teaching the alphabets. Glad I made the decision to check this website out. Such wonderful activities, and that toddlers and two year old are included, thks a million.